WOW. Playing this against Control would be devastating. 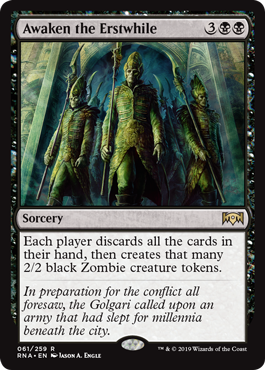 I'm sure there's a way to build a Golgari Dredge deck that uses Pilfering Imp to force through this Control wrecker. I like it a lot. The zombie clause is why? I guess on the plus side, it helps you use Golgari (and Izzet) cards. I'd try it as a one-of in modern dredge, not sure how good it is at 3BB, but seems cool.